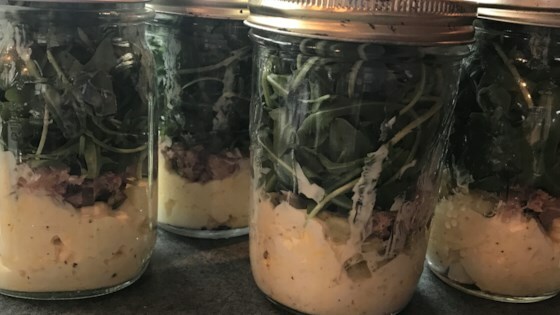 "Make these on Sunday and have 4 meals ready for lunches or dinners during the week!" Mix eggs, mayonnaise, and seasoned salt together in a bowl; spoon evenly among 4 pint jars. Layer pickles, tuna, and arugula on top of mayonnaise mixture. Cover tightly with lid and refrigerate. See how to make fresh, fantastic lunches in a shake! I love this!! So simple and easy, and it tastes great!